Members of the Novice B Crunch with their medals following their win at the Halloween Havoc Tournament. Submitted photo. The Napanee Novice B Crunch battled through a five minute overtime and eight shootout rounds to emerge as West Northumberland Halloween Havoc Novice B Champions. 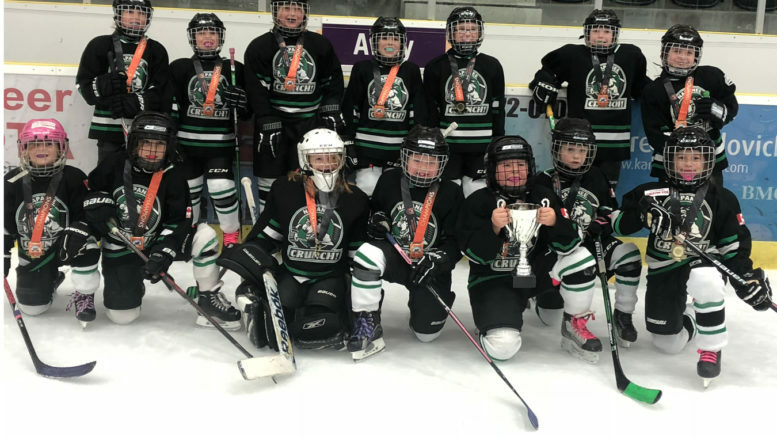 They edged the Whitby Wolves 3-2 in Sunday’s finals, courtesy a goal from Claire Jarmin, assisted by Erica Coffey and Talia Eberle, and the second from Claire Clapp, assisted by Karleigh Wales and Calla Cox. Wales, Jarmin and Shaye Brown each scored in the shootout to seal the 3-2 victory. Napanee opened the tournament with a 5-3 loss to the Peterborough Ice Kats. Wales had two goals whole Jarmin had one. Alannah Sanford, Clapp and Cox earned assists. They dropped their next game 3-0 to the Wolves, before going on an undefeated run to the gold medal. They blanked the North Durham Blades 1-0 with Wales picking up the lone goal with help from Sarah DiFazio. Peyton Bowers earned the shutout. In the semifinals the Crunch topped the Ice Kats 5-4 with goals from Jarmin, Wales (two), Kendal Hunter and Eberle. Rachel Raney, Erica Coffey (two), Eberle and Hunter (two) collected assists. Bowers was solid in net throughout the weekend. -The United Atom B Crunch also took part in the Halloween Havoc tournament, reaching the semifinals before losing 4-0 to Stoney Creek. In their first game they skated to a scoreless draw with Toronto Leaside, with Mikenna Ford earning the shutout. In their second game they blanked the Keene Wolverines 4-0, with Yakowennare Brant perfect in net. Lexa Lazarakos, Kailee Jacklin (two) and Molly Crook-Martin had the goals with assists to Brooklyn Prevost, Cook-Martin, Carley Uens, Maddy Nugent, Lazarakos and Norah McGuinness. They then lost to Stoney Creek Sabres, 1-0, tied Carleton Place Cyclones 2-2 and lost to Stoney Creek, 4-0 in the semi-finals. -The Peewee BB Crunch beat the Kingston Ice Wolves, 4-0 on Thursday as Diana Wharton earned the shutout. Goals were scored by Claire McConnell (two), Kristen Sutton and Charley Weir. Assists came from Hailey Lay, Alaina Holmes (two) and Neeligh-Raye Ford. On Saturday they tied the Peterborough Ice Kats on Saturday, 1-1. Keyra Herrington held the Crunch in there with solid goaltending and the goal was scored by Kristen Sutton, unassisted. On Sunday they battled the Wolves to a scoreless draw. Wharton turned aside every shot for the shutout. -The Bantam B Crunch also traveled to Cobourg to play in the Halloween Havoc tournament this weekend, going 2-1-1. They began their weekend with a 2-2 tie against Norfolk. Ainsley Hickerson and Hunter Haines provided the offence. In their second game they squeaked by Kemptville 2-1. The Crunch jumped out to a 1-0 lead on a goal by Claire Whitney. Kemptville tied it up but the Crunch put on a furious fore check late in the game. Whitney turned the puck over behind the net and got the puck to Abby Kish who skated out in front and buried the puck to win the game. Savannah Mumby was solid in goal. Game 3 saw the Crunch light the lamp seven times to beat the Ennismore Eagles, 7-0. Mumby picked up the shutout. Whitney and Anna Hagerman each notched a hat trick and Kish added the other goal. The Crunch lost Game 4 by a score of 2-0 against the host West Northumberland Wild, knocking them out of the tournament.